Pollution, armed militia and communities evictions are some of Vale S.A.'s alleged violations. Mud sea in lower part of Vale in Brumadinho, Minas Gerais. Photo: Cadu Rolim/Fotoarena/PA Images. All rights reserved. 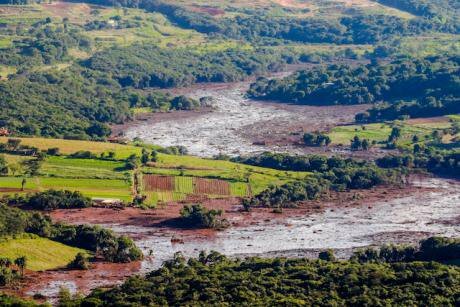 At the small city of Brumadinho in southwest Brazil, a dam owned by the country’s biggest mining company, Vale S.A., has collapsed. On 25th January, it liberated over 12 million cubic meters of rejects, which fell into the Paraopeba River. The mudslide has swept houses, workers, and animals. So far, 99 people were found dead and still 257 are missing. “History is repeating itself”, tweeted former environment ministry Marina Silva. Three years ago, a barrage controlled by a joint venture between Vale S.A. and the anglo-australian BHP Billiton crumbled, destroying the municipality of Mariana. Considered to be Brazil's worst environmental disaster, the incident at Mariana cost the lives of 19 people. The mire reached rivers and 7 states still feel its impact. Mariana’s victims have been fighting in court for fair compensation. No individual has been convicted nor has the case’s trial been scheduled. Nevertheless, Vale S.A. requested in December last year to expand in 88% the capacity of Córrego do Feijão mine, where the broken dam of Brumadinho is located. As reported by The Intercept Brasil, the company knew about the risks, but omitted them. And officials accepted the solicitation, ignoring environment protection entities. “The brumadinho disaster has to be investigated as a crime” said Baskut Tuncak, the UN Special Rapporteur Human Rights & Toxics. Yet, problems with Vale S.A.’s are not restricted to the brazilian territories. The company operates in more than 30 countries. And there are alleged violations in at least eight of them. To explore coal in the province of Tete in Mozambique, Vale S.A. resettled around 1300 families. The corporation promised food, housing and infrastructure but barely fulliled any of its commitment. According to a report from Human Rights Watch, the households had difficulty to access enough reliable water or quality agricultural land after their removal. Last year, Tete residents closed a mine for more than 10 days, after several attempts to negotiate a solution to the high levels of dust in the air. The list of accusations includes slave labor in Brazil, water pollution in Argentina and New Caledonia, corruption of Guinean political leaders, and espionage of workers, popular movements and journalists. In the province of Newfoundland and Labrador in Canada, a workers strike lasted over a year. In order to make a way to Sulawesi nickel mine in Indonesia, Vale S.A. has expelled the indigenous Karonsi’e people who live there. Communities from Cajamarca, Peru, denounced the use of paramilitary militias to threat protesters. There, Vale S.A. has a daughter company called Miski Mayou, which extracts and exports phosphate. In 2012, Vale S.A. was elected by Greenpeace as the worst company in the world. The many conflicts with Vale led protesters to organize the First International Meeting of the Affected by Vale in 2010 in Rio de Janeiro. The event gathered 160 people from the five continents. On the day the dam broke in Brumadinho, the group released a public note. "We sympathize with all those affected and keep shouting: it was not an accident!"